Adorable meets accessible when you pair mementos with Command Display Ledges. 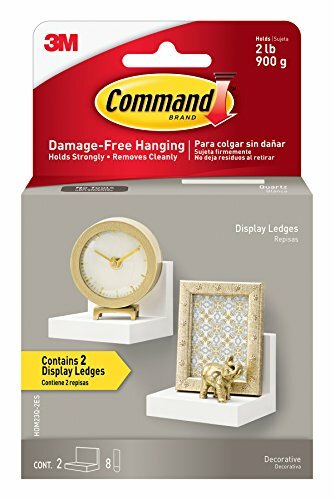 Command Display Ledges are simple to hang - no tools required! Using the revolutionary Command Adhesive, Command Display Ledges hold strongly on a variety of surfaces, including paint, wood, tile and more. Yet, they also come off cleanly - no holes or sticky residue - providing a great alternative to damaging screws and nails. Reusing our white picture ledge is as easy as applying new Command Refill Strips, so you can take them down, rearrange, and reuse again and again! Pairs well with Command(TM) 21" Quartz Picture Ledge to create a gallery wall.